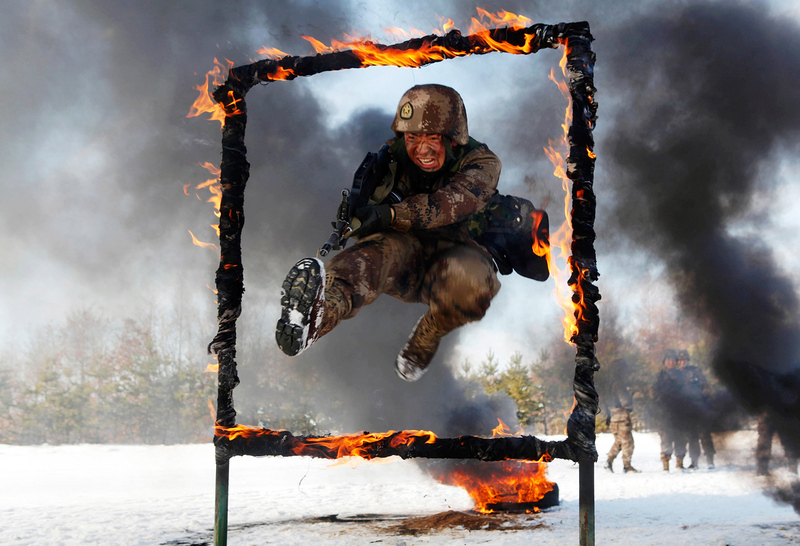 A People's Liberation Army soldier jumps over a burning obstacle during a training session on a snowfield, in Heihe, Heilongjiang province. Under President Donald Trump, Washington is unlikely to change its policy towards China and Asia. On the contrary, Trump seems to be more decisive in pursuing goals set by previous administrations. Vasily Kashin writes on the implications of Trump’s China policy and whether it would lead to a de facto military alliance between Beijing and Moscow. For a correct assessment of the possible impact of the policies of the new American President Donald Trump on Chinese military planning it is necessary to get rid of two important misconceptions. The first misconception is that Trump’s China-bashing is in complete contrast to the policy of the Barack Obama administration. The decision to turn to Asia and implement a series of measures that give the impression that the U.S. is preparing for a possible conflict with China were started under the previous administration. It was then that the U.S. began to increase its military presence in the Pacific and strengthened the existing system of military alliances. As for the trend towards increased military and military-technical cooperation with Taiwan, it was explicitly delineated in the presidency of George W. Bush. Trump rejected a key initiative of Obama's economic diplomacy in Asia – the Trans-Pacific Partnership (TPP), but did this for purely political reasons. The agreement was the most important object of hatred of his voters, and they would not have forgiven attempts by Trump to keep this agreement. Although the Trump administration is not responsible for the geo-political tensions between the U.S. and China, it is likely to continue with the policies of previous administrations in Washington, showing greater resolve and consistency. The second misconception surrounds rapid militarization around the world. One needs to take into account the inertia of most military programs. It takes a long time to create complex and expensive weapons systems from scratch when compared to processes from the mid-20th century. Many of the new weapons systems, which are going to be deployed, were ordered a few decades before. For example, the development of China's DF-41 missiles began in the late 1980s. Political changes occur more rapidly than advances in military-technical innovation. As a result, the military planning of major countries takes all possible risky scenarios into account. And this is why Chinese military planning in the 1990s was largely built around a range of possible clashes with the United States. Increased American pressure on Russia that occurred in 2014-16 resulted in a significant intensification of Russian-Chinese cooperation in the military and military-technical spheres. The scale of bilateral military-technical cooperation approached the record levels of the 1990s and early 2000s (in 2016, Russia supplied China with $3 billion worth of weapons). In addition, joint military exercises have become more complex and diverse. A new round of U.S. pressure on China is likely to strengthen the interest of Beijing to cooperate with Moscow. Russia-China military interaction is already intense. A major step forward for Russia and China would be the creation of a military-political alliance. Such a union would create conditions for joint actions of the two countries in different parts of the world and put China under the Russian “nuclear umbrella.” But such a move would require a revision of the basic principles of the foreign policy of both China and Russia. In China, with decades of rejecting military alliances in principle, such an approach seems the most difficult, although it could be a subject of debate. We can assume that a more aggressive policy of the Trump administration will lead to some retaliatory tightening of the political line of China and increasing investment in defense. This could increase the number and scale of joint military exercises, and a possible extension of programs of military-technical cooperation with Russia to accelerate the implementation of China's important military-technical projects. However, at the moment, there are no signs from Moscow or Beijing Indicating that either side is ready for a formal alliance.